Not all kids happily embrace brushing their teeth. Furthermore, many children don’t brush long enough, or they have trouble realizing which spots in the mouth they missed. As parents, we need to check on our children’s brushing habits, but doing so can cause battles. The goods news is that there are fun dentist-recommended products parents can use to help win kids over. Whether you have a reluctant toddler or an impatient child, here are 3 of our favorite things to help kids brush their teeth effectively while having some fun! Tired of battling your toddler to brush their teeth? Try the Brush Your Teeth Bear by Gund. Kids love how this cute bear brushes his teeth along side them. Parents will love that the bear brushes for the AAPD recommended time of two minutes. The bear also gives encouraging reminders to “keep going” and lets the child know when there’s “still one minute to go.” Finally, the bear celebrates how clean and sparkly the child’s teeth are at the end. Certainly, this friend will help make brushing a child’s teeth a fun time, rather than a battle. Are you worried your impatient child isn’t brushing as well as they should? Brushing one’s teeth thoroughly, like other skills, takes practice and coaching. Some kids, though, are not happy to have a parent point out missed spots. Than answer is a toothpaste that does the coaching for the parent. Kids brush on Plaque HD Toothpaste like a regular tooth paste. The toothpaste dyes all the plaque in their mouth an aqua color, so the child can see where brushing is needed. Then the child brushes with his or her favorite toothpaste until all the stained spots — along with all the plaque — are brushed away. Now parents don’t have to be the ones telling kids they missed spots. They’ll see it themselves when they smile in the mirror! It becomes a game to search and destroy all the colored spots in the mouth. Such a game is sure to keep brushing teeth fun for kids! 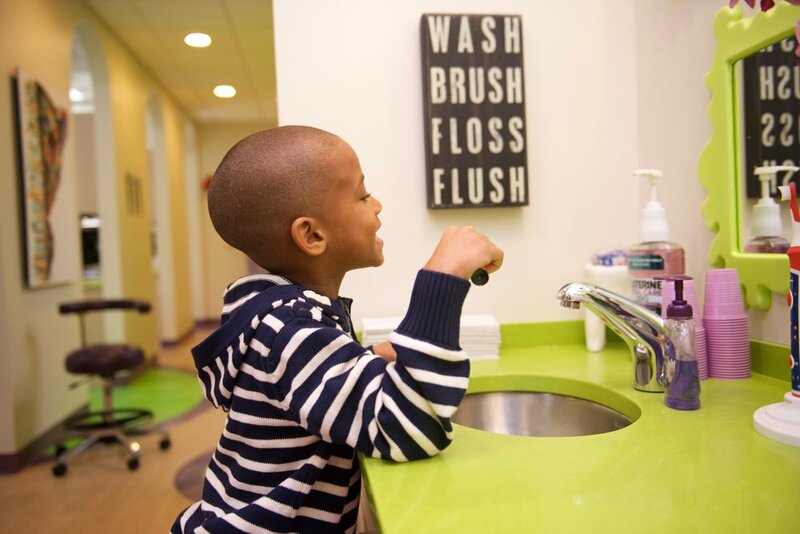 Are you worried your kid needs help brushing, but you’re not sure in which ways? The Kids Sonicare is your answer. This rechargeable toothbrush connects via Bluetooth to a phone or tablet. The Sonicare app then directs kids where to brush and for how long. Kids can unlock rewards along the way for good habits, too, turning this task into a game. Finally, the toothbrush boasts 500 strokes per second! This feature is particularly helpful for kids who typically have some coordination difficulties. Indeed, it’s hard to beat the fun and superior cleaning this product has to offer all children! No matter which products you use, have your kids brush and floss for two minutes, twice a day for good oral health. If you need more tips and tricks to help avoid brushing battles at home and keep brushing teeth fun and effective for kids, give us a call at (330) 425-1885 to schedule an appointment today. Dr. Laura Adelman, D.M.D. and Dr. Rachel Rosen, D.D.S. at great beginnings pediatric dentistry are taking new patients under the age of twelve. We would love to help give your child great beginnings to a great smile! *This blog is for informational purposes only. It is not medical advice.